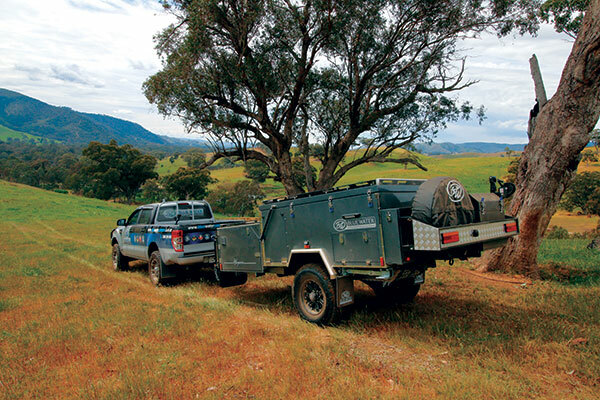 There is just so much to love about camper trailers in Australia. Our huge and often hostile environment serves up unique problems that help foster the world’s best imaginations, engineers and accessories. A case of obstacles inducing ingenuity to create the best mousetraps at the most competitive prices, so to speak. 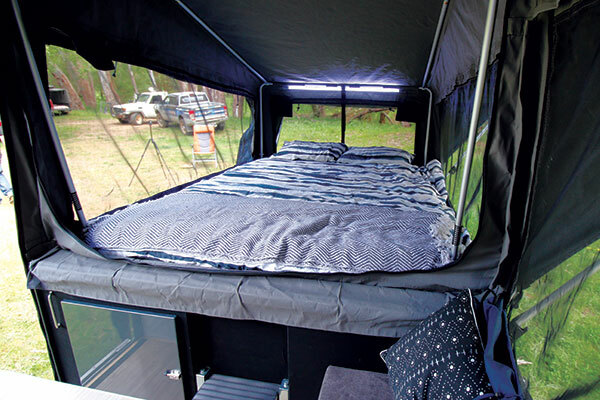 The current trend towards forward fold campers has given birth to a vast array of offerings and one of my favourites is the Bluewater Macquarie from Victoria. Bluewater’s Operations Manager Robert Harley is one of a group of dedicated professionals striving to innovate and elevate the Bluewater range of products. The results with the latest Bluewater Macquarie are exciting. This camper has all but eliminated many of the problems with ease of use, while offering an array of sensible features and benefits with a real eye for quality. The Macquarie started its life as the “Murray” as formally reviewed by Camper last year, but the name evolved after a competitor claimed it as their own. Seriously, the Murray! The explorer Sir James Sturt who named the mighty Murray River after the British Secretary of State for War and the Colonies Sir George Murray would be rolling in his grave at the thought, but Robert and I just joked about it and he turned the other cheek by introducing the new namesake. I hope Mr and Mrs Macquarie don’t mind! In true Aussie form, Bluewater took the Murray and made it better in the Macquarie. It evolved from its predecessor by combining all the features and elements that we loved then adding a huge array of innovations and improvements. The main shell, galvanised chassis and swing arm assemblies are manufactured internationally, as are the tent and awnings. However the canvas is premium Australian Wax Converters Dyna Proofed 14oz with YKK zips and fine mesh screens to keep the mozzies and creepy crawlies at bay. This is quite a deep tub that allows a multitude of goodies to be stacked up and including the awning roof that can remain attached for easy assembly and pack up. 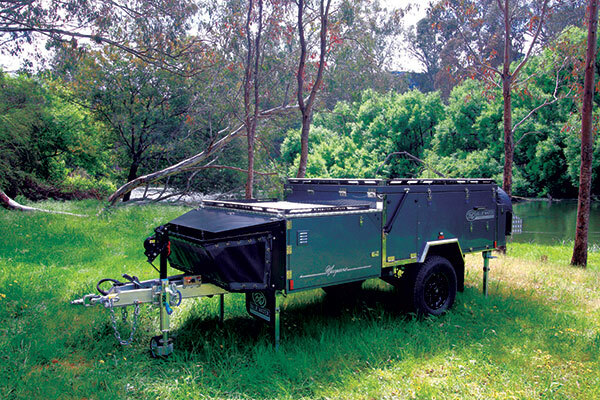 The Macquarie is simply one of the easiest forward fold campers on the market. The top pivots easily on well weighted gas struts which can be lifted either manually or assisted by the forward winch, if you feel a little less than strenuous. Bingo! – the tent pops open easily with some innovative new springs on the main bow and tropical roof, plus another pair of gas struts that stretch the rear bow into taught position. The innovative structure immediately assembles the high-roofed tent into premium set up with no adjustment to the internal hoop poles. Robert calls it the “non-adjustable, spring-loaded, gas-strutted pole system” (try and remember that after a few beers). You can put a couple of spreader bars in if it looks like a windy night otherwise its instantly ready for an overnighter. It’s a pleasure to see good canvas construction, and it also helps you sleep well at night knowing you are surrounded by the security of a properly waterproof environment that has been well manufactured with insulation. There are inner and outer awnings for convenience along with sewn in storage pockets and cavities for all of the LED light strips and their concealed wiring. Bluewater’s Macquarie packaging includes a properly sealed cabin divider, draft skirts, a 2.4m wide annexe with full enclosures including a very large double ensuite tent combined into a side wall. The ensuite can also be set up independently away from the main tent with an additional two poles and guide ropes if required. The overall annexe area has been increased considerably with the inclusion of a rear wall awning that extends from the lounge (back) of the trailer allowing even more undercover protection for your push bikes, firewood and assorted camping and sporting toys, and takes the annexe length to a huge 6x2.4m. At the other end of the trailer is the ensuite that is separated into both a wet and dry room including a divider screen and PVC floor. It really is very liveable! The Tare weight is still 1500kg which reflects the quality, size and facility of the complete package. The GVM has been increased to 2400kg with Dexter 12in electric brakes plus breakaways to allow for larger load weights which will be expected with twin stainless-steel tanks with a combined 160L capacity, plus the usual camping and recovery gear, clothes, food and drinks. Underneath is a full 75x50x3mm box section sub-frame with independent trailing arm suspension, locally supplied Lovell coil springs and dual Ridepro custom shock absorbers each side. There's also custom made polyurethane bump stops, Primal 16x8in alloy wheels and your choice of mud or all-terrain 265/75 R16s. 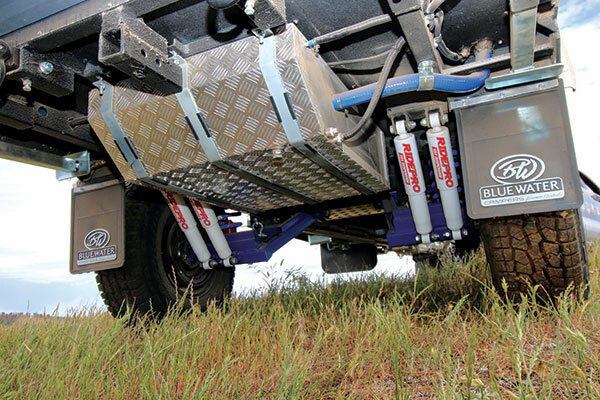 The Macquarie has also been upgraded with strong Manutek stabiliser legs and out front is an ARK X-Series 750kg-rated jockey wheel plus Anderson plug, hand brake, forward winch post and the increasingly popular McHitch 3.5 tonne Uni-glide trailer coupling. There’s a strong stone guard with replaceable mesh plus a huge tool box that also secures the twin 4kg gas bottles plus numerous jerry cans if optioned. 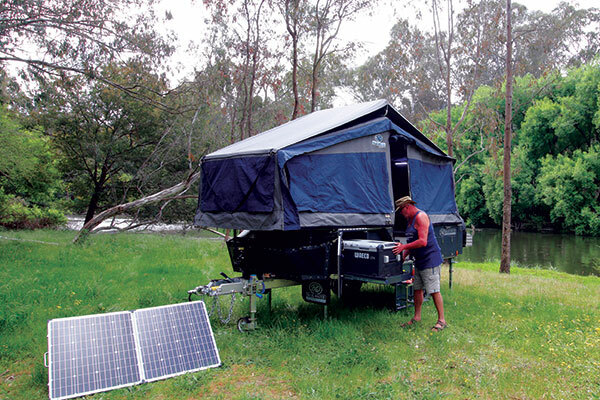 Bluewater has made camping easy by including hot and cold water fittings plus a gas bayonet on the 125x50x4mm A-frame drawbar, which feed the Smarttek 6 portable hot water system for the ensuite and sink. Out back the rear end has had a total new design featuring a full width pole compartment with a shelf divider for the selection of alloy poles, plus there is a pivoting bumper that retains the spare wheel and a very handy tool box that is ideal for those quick on-road necessities. This also allows some fulcrum effect for those who are smart enough to balance their load and drawbar weight. 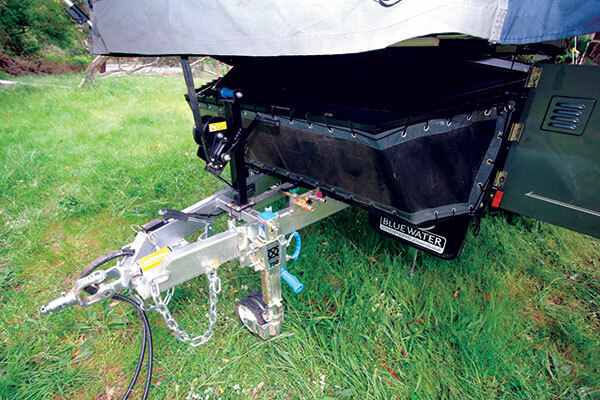 The undersides have twin rated recovery points with a slide fitting for an optional push bike carrier and there is still a good recovery angle, so the bum of the trailer isn’t dragging in heavy undulations. The water tanks are fully shrouded for protection and fitted with sturdy bungs and fittings, however I would like to see a solid elbow on the water tank supply line which would reduce the chance of ripping the hose from the tank fitting. It’s a minor point with major consequences if it were to occur in a hot, remote destination however Rob guaranteed it would be fitted as standard in future. Another point of innovation is the water tap on the rear undersides that not only serves as a water outlet, but it has a two-way valve and pressure reducer allowing mains supply to be connected if you are in a caravan park or similar. It allows you to bypass your water tanks all together. There is also an easy tank crossover valve to choose your desired water supply and Bluewater have chosen a quality SeaFlo 42 series water pump and John Guest water lines and fittings throughout for longevity in service. We find the twin 100A AGM batteries securely mounted in a lockable compartment to the rear with the electrical control panel just in front of the wheel arch. This cabinet contains the isolator switch, individual analogue water tank indicators, voltage and rate of charge indicators as well as a five-gang fused switch panel for the fridge, pump, lights etc. The large front box has tonnes of smart storage with a voluptuous compartment forward as well as a separate locker with a large drawer beneath an upper shelf where long poles such as fishing rods can be housed securely, but easily accessed. The kerb side of the Bluewater Macquarie is where the party really starts. There is a large fridge slide up front that is capable of carrying a full 65kg of load, and some of the largest available portable coolers. 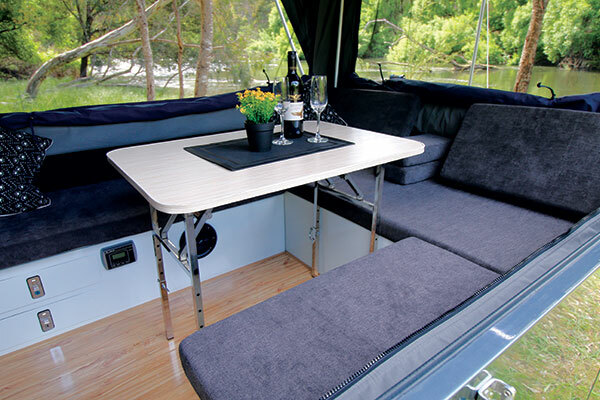 It has pressurised venting to the fridge compartment and all storage on the Macquarie is carpet lined with hard wearing vinyl floors and features sensor lights on opening. 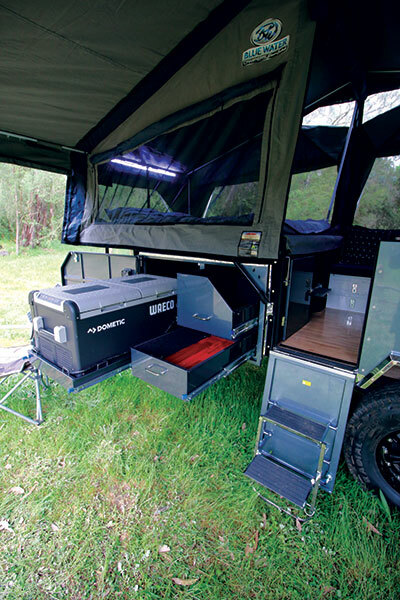 Next door is a second compartment with a pair of deep pantry drawers providing vital storage for any offroad adventure. Up top, the roof has its own racking and tie down points for more load capacity when folded for the road. The Macquarie doesn’t really need a boat loader as the top of the camper has a loading and tie down facility that’s ideal for the fishing kayaks, however you would have to lift the vessels off each night to set up camp. The stairwell folds down and out of the doorway for easy entry and departure. There’s even a second doorway inside that serves as a doggy door, or maybe to keep small kids confined inside without the risk of them falling down the staircase. The stainless-steel kitchen slides effortlessly out of the rear of the trailer completing the living area. Bluewater’s engineers have utilised a “snake track” convoluted flexible hose retainer that means there is no more assembly of the power and water fittings as you slide out the kitchen. It simplifies the process just one step further giving you more time to enjoy your surroundings rather than fiddling with hoses and fittings. This is a good kitchen complete with a Dometic three burner stove, three utility drawers for utensils and cutlery, tonnes of LED lighting, 12V and USB power outlets, plus a slide out preparation bench from the end and a full-length bar table that hinges off the top. The kitchen is stabilised with alloy legs and there’s even a fold-out dish rack that comes in extraordinarily handy for all manner of jobs. This kitchen is simply a ripper. A quick look from the outside of the Bluewater Macquarie will not reveal all the secrets that lie within. It’s a combination of the little things that make a house a home and clever design touches. Homely ingenuity is, I think, a good two word summary of what Bluewater has achieved. Firstly, you will be inspired by the panoramic windows all around bringing the outside in and vice versa. But you don’t want all the critters from outside in your sleeping compartment, so Bluewater have taken care to seal the cabin divider as much as possible to keep the creepy crawlies and mozzies at bay. There are both inner and outer awnings on all the windows plus midge mesh screens and finished with high quality YKK zips. Up front is a queen size Australian-made inner-spring mattress to maximise your comfort and there’s even a little step to help you get there. The tent is really quite tall, expanding a sense of volume, but also providing a more comfortable environment in the heat. The U-shaped convertible lounge has a good deal of storage under the seats, but it also contains a Ctek 250SA DC-DC charger which can be whacked on most late model vehicle's smart alternators or via the 200W portable solar panels that are supplied as standard. Inverters and other electrical options are available on request. Immediately to hand on the right side of the entry is the internal switch panel that has been upgraded with soft touch switches and a complete multi-function control panel that also includes an MP5 player with Bluetooth and mass storage for all your entertainment needs. There are tonnes of power outlets throughout and 240V is optional but wasn't supplied in our demo. The internal upholstery has been improved with lush but hard-wearing textures and the central table drops down to create the base for a double bed utilising the thickly padded cushions. The lounge end of the tent is now taller, creating a more inviting atmosphere and the kitchen side can all unzip for true open plan living. What started as just another import has matured into a premium quality presentation from the gang at Melbourne-based Bluewater Campers. Campers all over the country are respecting the workmanship and service from Bluewater outlets. The Macquarie has unique, yet sensible packaging options offered at very reasonable prices. Full marks to the team for really putting their heads down and bums up to produce this fine camper that anyone would be proud to own.